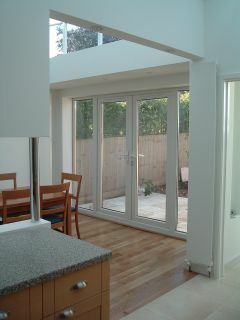 This project extends dining and kitchen areas at the rear of an existing semi-detached house. An existing garage is rebuilt in timber frame and clad with timber boards to create a study and new storage space. The areas in between are filled with a new utility room and a new semi-open glazed gallery linking the existing house with the newly proposed areas. 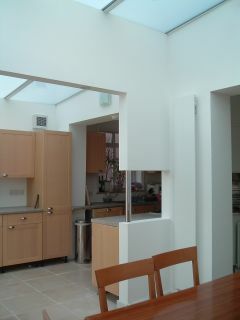 The major feature in this project is a new double glazed roof above the extended dining and kitchen, using a frosted laminated glass, which blocks direct sunlight and diffuses the natural light. 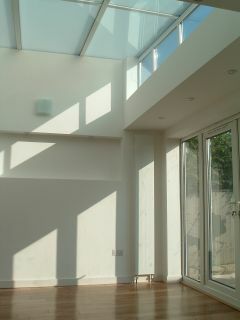 Other stepped sections of the roof have high-level windows to allow direct sunlight into the interior, to give variety and interesting light effects.